Ethan Hollingsworth is one of the handful of relievers who have pitched more than two of Omaha's starters. I was going to write up something about how heavily taxed the Omaha bullpen is, but I didn’t want to accidentally make a Tax Day pun. And yet, here we are. Starter: Will Smith – 3.0 innings (he was on a pitch limit, and walked six). So far, the Omaha relievers have had to throw an average of more than five innings every night. 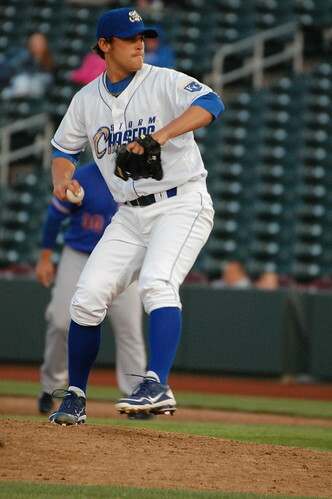 To make matters worse, the Chasers lost Louis Coleman to the Majors yesterday, and has not had another reliever added in his absence. Mike Jirschele is in as tough a position as a manager can be – he is hamstrung by a worn-out bullpen immediately upon starting the season. That’s typically an August or September situation. Meanwhile, most of his starters keep faltering in the early innings (or are on limited pitch counts). Somehow, the team is still 9-3. If I added this correctly, the starters have pitched only 54.2 innings – so much less than the bullpen, which is problematic on so many levels. The Chasers are heading to Round Rock for a 4-gamer before coming back home this weekend. Unless the starters get it together in a hurry, the first-place Chasers are almost certainly going to suffer a rough patch. EDIT: Before anyone points this out, I know – Sean O’Sullivan and Ethan Hollingsworth, and at times Roman Colon, are starters. So it’s not like they are strangers to pitching more than one inning at a time. However, the fact is that they still have a finite number of bullets and those are getting burned fast, and it’s only mid-April. And the starters need to pick up some slack. A local prayer group provided the funds to purchase food packages for several families one November. One mother was ecstatic over the fresh fruits and vegetables—they are luxuries on a tight grocery budget. The other family was thrilled to have a Thanksgiving dinner, rather than the canned pasta they would have otherwise been eating. Please consider supporting the Family Resource Center by doing your regular Amazon shopping via my Affiliate link. ALL proceeds from the month of April will go to the Center.